Norwalk runningback Jakari Walker (1) loses the ball under pressure from Westhill Sakoi Cheatham (55) in a FCIAC football game on Saturday, Sept. 15, 2018 in Stamford, Connecticut. Norwalk defeated Westhill 48-21 in the Vikings home opener at J.Walter Kennedy Stadium. STAMFORD—Coming into the game, the Westhill football team knew the Norwalk offense could beat them in a variety of ways. Turns out, the scouting reports were spot on as Norwalk scored on the ground, through the air and on special teams, dismantling Westhill 48-21 at J. Walter Kennedy Stadium Saturday afternoon. That Norwalk fumble two plays into the game turned into a Westhill touchdown three plays later when Richard Felius ran in from 2-yards out for a touchdown. Norwalk would fire right back, scoring on its next drive on a 4-yard run by Jakari Walker. From there, Norwalk’s offense rolled behind the arm and legs of quarterback Kyle Gordon and a talented group of receivers and running backs with five different players finding eh end zone. AJ Robinson scored next on a 5-yard run, followed by a 56-yard pass from Gordon to Robinson. AJ Laccona ran the ball in from 9 yards out for Westhill but on the ensuing kickoff, Walker returned the ball 86 yards for a score. Less than a minute later, Westhill would score its final touchdown on a 9-yard pass from Laccona to Angelo Nicholas, getting within 27-21 midway through the second quarter. 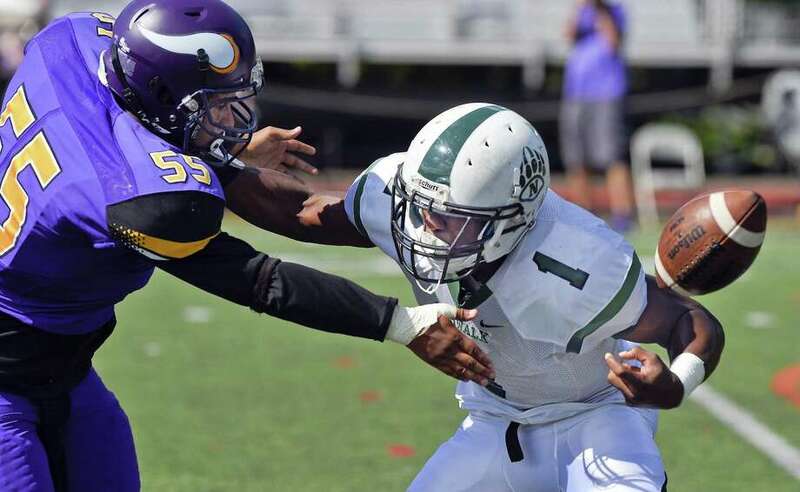 Norwalk would not allow another Westhill touchdown while its offense kept on rolling. Khalil Eason scored on a 27-yard pass from Gordon, Jamal Boyd hauled in a 41-yard touchdown pass and Jerome Moorer capped the scoring with a 12-yard touchdown in the fourth. Gordon and Robinson link up for a 56-yard TD. XP good. Kyle Gordon, Norwalk. The junior threw three touchdown passes and made play after play with his legs both on designed runs and scrambles.